This piece is not a statue, but an oil painting on panel entitled “The Annunciation Diptych.” Jan van Eyck had finished this diptych circa 1433-1435. It measures 38.8 x 23.2 cm and is held at the Thyssen-Bornemisza Museum in Madrid, Spain. A diptych consists of two panels attached together with hinges and then can be closed like a book. This panel is depicting the archangel, Gabriel. This depiction is a good example of grisaille painting, which means that a painting is done completely in neutral or grey colours and done most often when trying to recreate a sculpture on a 2D surface. Van Eyck started with a black surface and gradually brought out the figure in all of it’s glory. The use of shadows in this piece allow the figure to take on a 3D appearance also known as trompe l’oeil, which in French means to deceive the eye. The frame surrounding the figure also has a life-like effect. At the top of the frame is an inscription in Latin saying “Hail, full of grace, the Lord is with thee,” which is a phrase taken from the Gospel of St. Luke. Since this is a diptych, that means there are two panels. 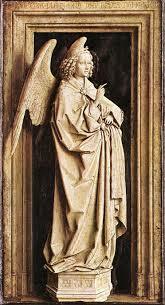 On the other panel (not pictured) is the Virgin Mary, depicted in the same style the archangel Gabriel is portrayed in. The Virgin Mary’s panel also has an inscription on the top of the frame surrounding her body that says, “Behold the handmaid of the Lord; be it unto me according to thy word.” These phrases depicted are the first and last spoken between the archangel Gabriel and the Virgin Mary.